Does your group need to make the shift from managing a practice to building a business? The past two years’ economic downturn has left its mark on radiology practices. In many places revenue and volume are down. Many radiologists fear that more of the same is the new normal. People are putting off nonessential healthcare. Without increased volume, it’s difficult to offset the Deficit Reduction Act (DRA) reimbursement cuts. Healthcare reform is expected to cause even more belt tightening in imaging. Even though the future doesn’t seem as bright as it used to, some people in the industry see the new state of affairs as nothing more than a natural correction. As Daniel Corbett, RT-CPC, vice president of radiology consulting company Radiology Business Solutions, points out, imaging is one of the core technologies of modern healthcare. In many cases, emergency department physicians want to see a CT before they even begin assessing a patient. Primary care physicians frequently prescribe imaging tests to either rule out or confirm a diagnosis. That’s not going to change. What has changed is that there’s more competition for patients. More people are doing imaging these days. Obstetrician/gynecologist offices have ultrasound machines. Orthopaedic offices have MRI scanners. Hospitals and large radiology groups have been making a push for a larger share of the market. “What I’m seeing, frankly, with a lot of radiology practices is there are a couple of large [radiology] groups that are going around buying them, purchasing the assets, and putting the doctors on the payroll or the hospitals are purchasing them,” says consultant Mike Fleischman, FAAHC, of Gates, Moore & Company, a physician practice management company. Smaller practices will need to aggressively pursue business and eliminate wasteful spending if they want to succeed in this environment. Corbett says radiology groups aligned with hospitals are in a better position to compete than practices that aren’t. For this reason, it makes sense for radiology groups that don’t have hospital contracts to pursue them. But maintaining a hospital contract isn’t as easy as it used to be. 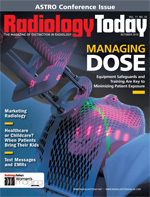 Teleradiology has established a presence in the imaging world, and a hospital may be tempted to use the teleradiology threat to extract concessions from a radiology group. Also, administrators don’t want to deal with referring physician complaints, and if they get a lot of them, they may consider switching to a teleradiology-based group. The best way to avoid this scenario is to keep the hospital and referring physicians happy with the level of service they receive. Corbett says it’s imperative for the radiology group to listen to what a hospital’s referring physicians say about their customer service. It’s irrelevant whether the radiologists think they’re doing a good job. “The radiology groups out there need to make a concentrated effort to bone up their relationship with their hospitals, look at their radiology service agreements, and look at all the issues related to how they’re servicing the medical staff,” Corbett says. But regardless of whether a practice has a hospital contract, Corbett says practices need to streamline their operations. He recommends examining every aspect of the business, including billing, benefit plans, staff size, workflow, reporting, and dictation, to make sure it’s running as efficiently as possible. He adds that it’s critical to maintain quality through quality assurance procedures and peer review. Fleischman says it’s also important to ensure the practice remains competitive in the reimbursement realm. To do that, a radiology practice must coordinate with the referring physician’s practice to make sure any necessary precertifications are handled quickly and smoothly. This has become increasingly important, as insurance companies tend to require more precertifications for imaging procedures. Another reimbursement issue concerns the contracts that radiology practices have with insurance companies. Fleischman says contract language should be scrutinized to ensure competitive reimbursement. Practices that fail to do so may be unpleasantly surprised. According to Steve Smith, senior consultant and account manager for Healthcare Success Strategies, a marketing company that serves healthcare organizations, most practices need to move from managing business to building business. Practices need to look at their referral patterns to see who isn’t giving them business and market to those people as well as current customers. Smith says selling is often perceived negatively, but practices need to sell their services to potential referrers. Smith suggests that practices maintain a 30-day call schedule and always have something new to talk about, such as new types of imaging or services. Reaching out to referrers has never been a bad idea, but it’s becoming essential. With price becoming more of an issue, practices need to demonstrate why they’re better than the practice up the street or a teleradiology outfit. Marketing representatives can help with the outreach that’s necessary to develop those relationships. “I’m actually running into more centers that are hiring, at least part-time if not full-time, marketing people,” says Fleischman. What those marketing people are doing is highlighting the customer service aspect of radiology practices. Fast scheduling, fast report turnaround, and courteous staff are selling points. Considering the damage that an unhappy patient or a less-than-responsive radiologist can do to a practice’s reputation, these points can be a deciding factor when referrers’ offices decide whom to call. In today’s business climate, anything less than five-star service puts a practice at risk of losing business. Effective outreach begins at the top. Good physician-to-physician relationships help a radiologist become more than just a name on a report; that kind of recognition helps avoid commoditization. If a practice has to compete on price alone, it will often lose. But picking up the phone to call in critical test results and offer expertise pays dividends. An often-overlooked aspect of good marketing is building relationships between a practice’s staff and a referrer’s staff. In nearly all cases, the person who schedules imaging exams is a nurse or an administrative person in the referring physician’s office. And in most markets, there are multiple options from which to choose. If a radiology practice has made the effort to develop a relationship between its office staff and a referrer’s staff, they stand a much better chance of getting that business. Corbett says he’s gotten good results with ambassador programs that provide one-on-one time between a radiology practice and a referrer’s office. He says lunchtime is a good time to schedule a meeting because most doctors’ offices are closed, and the staff members will almost always attend the meeting if lunch is provided. During this time, a radiologist may meet with the referring physician or physicians but, more importantly, the radiologist’s staff meets with the referrer’s staff to talk about how they can make the scheduling process easier. He says this approach has proven effective for maintaining current referrers and, in some cases, capturing new referrers. In addition to outreach, radiology practices need to look for new ways to build value. Fleischman says new services are in demand and can provide a competitive advantage to practices that have them. He cites interventional radiologists who do stereotactic biopsies for mammograms as an example. However, he cautions that bringing in a hot new specialty can cause some friction within the practice, depending on how workload and compensation issues are handled. Still, he believes the gains outweigh the drawbacks. “I think being able to tout that level of service is very important and very valuable, if you have it,” he says. And there are nontraditional sources that have yet to be tapped. Fleischman says some practices have begun offering their services to companies that handle workers’ compensation cases. He says workers’ compensation imaging has the potential to be a lucrative new revenue stream. Another area that is often overlooked is a practice’s Web presence. Although radio spots and billboard ads don’t generally justify what they cost because most patients will go where their doctor sends them, those who are inclined to shop around for imaging services tend to do so on the Internet. Smith says maintaining a good website is the best investment that a practice can make. All these strategies will be necessary to deal with the challenges radiology practices will face in the next few years. Continued consolidation and tougher competition will force practices to work even harder to grow their imaging volumes. Success will require everyone in an organization to maintain the same standards and work toward the same goals.